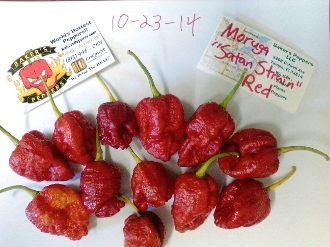 This variety is another variant of the Moruga Scorpion! Wildly hot and it grows very prolifically. It will mature from green to red. Grows from seed to harvest in 165 days. Its much hotter than the Moruga Red...how much hotter?? Grow some and find out! :) Purchase yours today!! Copyright © 2012-2019 BakersPeppers.com. All rights reserved.